Today was witness to my second ever Retro F1 event. Retro F1 is where I watch a classic F1 race in full on YouTube, tweet updates as I go and have some Twitter chat (using the hashtag #retrof1) with like-minded people! The race in question was the Brazilian Grand Prix at Interlagos, from the 2003 season. Righty-ho, I'm clicking play now. Off we go. We're clearly getting the Australian coverage, we'll be getting the James Allen/Martin Brundle partnership in the commentary. A little bit of scene setting. This is round 3 of the 2003 season. 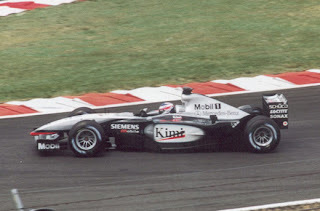 In 2002 Ferrari dominated, but have struggled in first two races of 2003, and McLaren have won both. Kimi Raikkonen leads the table on 16 points, David Coulthard is second on 10, then Schumi and others are on 8. @SartoMutiny Kimi looks about eight years old. That's because he is, I think. Yes, it was Alonso's first year racing a Renault, he took his 1st pole and podium in the previous round. @dsiggers #retrof1 is such a great idea! Now that is one tight grid: home favourite Rubinho on pole, followed by DC, Webbo and Kimi, in that order. The top 13 are within one second. @SartoMutiny Eddie Jordan, unusually, wearing hideously coloured clothing. It’s raining in Interlagos, both Bridgestone and Michelin have only brought intermediates, after an agreement to only use one type of wet tyre at each race. Don't care about rudimentary facilities etc - Interlagos is a fantastic F1 venue. Great track and guaranteed big passionate crowd. While we're waiting for the start after their short delay, here's something I wrote on Interlagos a while ago. @SartoMutiny Things That Will Make You Feel Old: when this race took place, Sebastian Vettel was 15 years old. Oh blimey, that does make me feel old. It's amazing the F1 drivers you forget about. Others on this grid include: Da Matta, Firman and Wilson. Anyway, off we go. Behind the safety car, and the tones of Brundle and Allen cut in. Schumi qualified P7 on wet settings, and then after qualifying everyone else was allowed to change setup - bet that cheered him up! @SartoMutiny Even though they are still behind the SC, it is still more interesting than almost every race from 2002. I'm confused. Didn't Verstappen start from the pitlane? If he did, how did he manage to get up to P16? @ElenaF1 Is Mayländer the SC driver there too? Yes, it will be will. Just checked Wikipedia and Maylander's been F1 safety car driver since 2001. Yay! Safety car in this lap. Let's go motor racing! Not clever from Rubinho, way too slow to get on the gas, Coulthard passes him into turn one to lead. Kimi and Monster Montoya looking super confident at this stage, all over DC in the lead. Kimi and Montoya eat into DC's lead in double quick time and sail past DC to be one and two. @SartoMutiny Montoya was fantastic. F1 is much poorer for his absence. Agree with that, F1 would be much the richer to have Kimi and Montoya still in it. @SartoMutiny Kimi was brilliant, when he could be bothered. Poor Ralf. He was good when out at the front with everything perfect, but tended to struggle in the pack. @ElenaF1 There was a time (Monaco?) when Ralf nearly collided with Michael. Ralf actually did collide with his brother in Nurburgring 1997, there may have been other times as well. @SartoMutiny There was one Hungarian race (2003?) when he went nuts and passed Big Brother, wasn't there? DC strolls past Montoya, did his early pace take too much out of his Michelins? The wily Schumi now coming into the picture. Bridgestone inters' grooves are shallower than on the Michelins, so the drying track is coming to him. Schumi now P4 and all over Montoya like a bad suit for P3. As soon as I say that, Schumi easily passes Montoya for P3, and will now hunt down the McLarens in one and two. @SartoMutiny Big shunt for Panis. Taken out by Ralph Firman when his suspension failed. Fisi (very, as it turned out) lucky to avoid it. Everyone pitting. Makes sense. Everyone that is, apart from Kimi for some reason. He'll end up with pitted and fuelled cars right behind him. @SartoMutiny Chaos in the pits. More than a few unsafe releases there. Alonso had slicks put on(?) in his first stop and had to pit on successive laps. He's now dead last. @hellasf1 Seems a good YouTube channel! Great, classic race! Off we go, race conditions and Kimi still leads. @LiteralF1 This can only be one amazing race which you're enjoying at #retrof1 and it involved some Irish yellow, correct? Schumi now monstering DC for P2, and Kimi ahead hasn't pitted. Is the race coming to him? And Rubinho, who's had a quiet race so far, has cruised onto the back of his team mate. Brundle, sharp as a tack as always, is the first to notice the rivers at Curva do Sol. And Montoya and Pizzonia aquaplane off in separate incidents! Schumi off at Curva do Sol as well and is out, seriously scary stuff there with cars and marshals around. SC out. Kimi pits a bit too late, and is now in in mid pack. Hang on, Ralf's third? When did that happen? Off we go again. Poor Ralf. @ElenaF1 Ohhhh!!! Ralf was able to overtake without crashing!! I always say about Interlagos: give the drivers a proper race track and they'll give you a proper race. @MKaipio So very true about proper race tracks. @SartoMutiny See also: Spa, Suzuka, Abu Dhabi, Silverstone, Monza. I might have been lying about one of those tracks. Button the latest victim of the Curva do Sol river, he was handily placed in P5 and was fuelled to the end apparently. SC out again. @SartoMutiny Jenson has a bit of a dodgy barnet. I hope that is helmet hair. @ElenaF1 Nice cars carnage at Curva do Sol. @SartoMutiny This #retrof1 thing is fascinating. Who would have thought that 7 years after this race Webber would have been in the same team, although in a rebadged version, fighting for a world title? This sport is so unpredictable and fast-moving, one of the many things that makes it a fantastic sport. Off we go again :) 'This is a race of survival' says Brundle, 'a bit like the Grand National' says Allen. @SartoMutiny Brilliant pass from Kimi. I had actually forgotten how brilliant he was. All of a sudden, I sort of miss him. @SartoMutiny After seeing this race, I do too. F1 would be a better place with Kimi in it, even in a mediocre car. Rubinho now looks like he has every intention of taking the lead from DC. @ElenaF1 He's in DRS time. @SartoMutiny At the time of this race, Fernando Alonso was 21. Incredible. Alonso almost immediately gets a drive though penalty, he passed under yellows somewhere. Rubinho leads after DC runs wide at turn one, the crowd are loving it! Rubinho then puts over 2.5 seconds on DC in a lap! Massa debuted for Sauber in 2002 and was Ferrari test driver in 2003, he was back racing a Sauber in 2004. 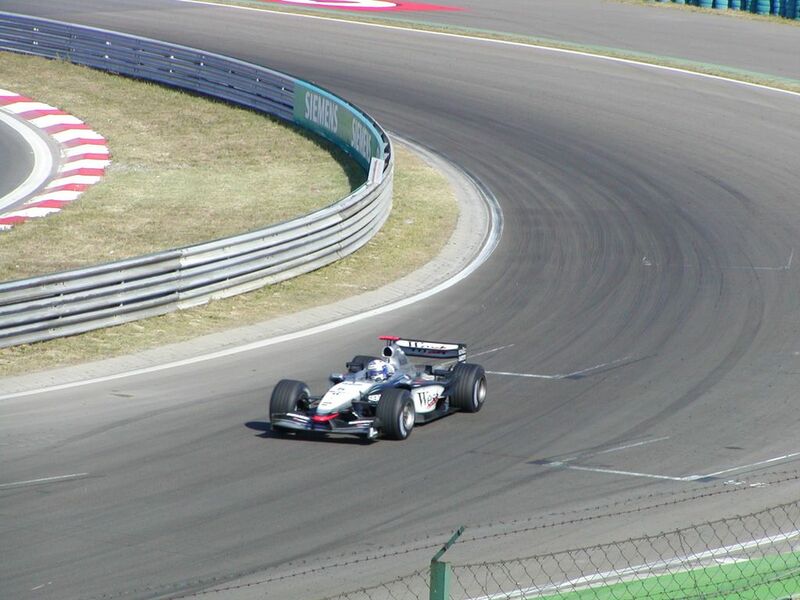 David Coulthard was capable of some fantastic drives. His problem was consistency, a bit like Carlos Reutemann. @SartoMutiny He was much less interesting than Carlos Reutemann. @EwanMarshall To be fair Reutemann threw away the 81 crown. Yes, the gap between Reutemann's peaks and troughs were a bit more extreme than were DC's. @SartoMutiny Fisi closing on Kimi for 2nd. DC now pitting, do the guys behind him need to pit as well? DC now back out in P4. Fisi, who pitted right at the start, is now harassing Kimi for the lead. Track coming to the Bridgestone runners. Kimi runs wide, and Fisi leads and leaves Raikkonen like he's standing still! Oooh, big smash for Webber at Subida dos Boxes. SC out. Alonso smashes at the same point and red flag out, is the race over? The Jordan team are celebrating already. Alonso looks a bit beaten up. Turns out he collided with some debris. Not clever. And Fisichella's car has set on fire, as if to sum the race up! 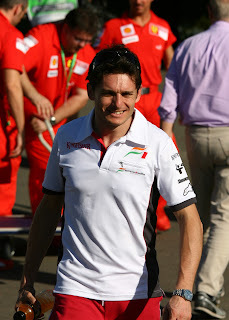 @hellasf1 Fisichella's JORDAN on FIRE on the pitlane! Here’s a happy Eddie Jordan! Only ten cars were running at red flag, under the current points system they'd all score points. @SartoMutiny Alonso being wheeled into an ambulance. Looked nasty, but he is waving to crowd so hopefully not too bad. Turned out he had nothing worse than bruised legs. In usual F1 style, they're taking a ridiculously long time to come to a decision on who's won. @SartoMutiny EJ on the phone, probably asking anyone he can think of whether he has won or not. Reaction suggests they know they haven't. DC was seriously unlucky in this race. He led most of the way but ended up P4 after pitting just before the red flag. Kimi’s declared the winner. The disappointment among the Jordan crew is palpable. EJ's sad face is heartbreaking. But...it turned out the clock should have registered that Fisi crossed line for lap 55 before the red flag came out, and didn't for some reason, so the final results were declared after 54 laps instead of 53, when Fisi led! Ten days later this win for Fisichella would be confirmed, he got the trophy at the next race at Imola. @hellasf1 Justice will be given back in Imola in 2 weeks time! Indeed, though still a pity Fisi couldn't celebrate win there and then! He hadn't won a race before at this point. @SartoMutiny That's the sad thing. I know they won it later, but they were deprived of their moment of glory. Shame. @vee8 My understanding was that the timing system automatically did the countback, but race control didn't realise so they did it again! @hellasf1 The last win of a Ford Cosworth engine, if I am not mistaken! @hellasf1 Guys thanks for the company, watching an all time great F1 race! 2003 Brazilian GP! Looking forward to the next #retrof1! At this point I'll draw our second #retrof1 to a close. Hope you enjoyed it. Awesome event, you must do more! Enjoyed the write up too.